Hiccups are simply involuntary muscle spasms of the diaphragm muscle. They can occur for a number a reasons, including eating too fast and swallowing air, chewing gum, eating or drinking too much, stress or anxiety, or there are more serious causes like nerve damage, brain tumors, and strokes. While there’s not necessarily an easy fix for those serious causes, when you get hiccups from swallowing air or eating too fast, there is a relatively simple solution– you need to stretch the muscle that’s spasming. A hiccup fix that actually works. If you woke up in the middle of the night with a leg cramp or muscle spasms, what would you do? The same logic applies to hiccups. 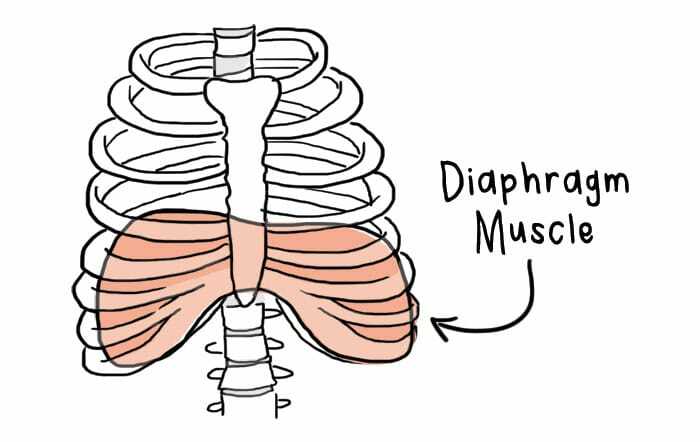 Your diaphragm muscle needs to be stretched to help stop the spasms. To stretch your diaphragm muscle, take a deep breath and hold it for a count of 10. Without letting that breath go, take another deep breath and hold it for a count of 10. Slowly breathe out and then return to breathing normally. You’ve just stretched your diaphragm! By taking all of those deep breaths, you’ll feel your stomach and lungs protrude out, giving that area a nice, deep stretch. I think this is also why drinking lots of water or even being scared can sometimes “work” as a cure for hiccups– because they might also stretch the diaphragm muscle. This method is just a little more direct. I hope this technique will help you stop hiccups in their tracks the next time they happen to you. Personally, I find them SO ANNOYING, so having this method in my back-pocket is a sanity saver! Reader Feedback: Do you have a go-to cure for getting rid of hiccups fast? Feel free to share more ideas in the comments below! It worked!!! I’m so relieved after trying everything, this actually worked. Thank you! I relax my diaphragm by sitting up straight and fully relaxing my stomach muscles, allowing it to extend as much as possible. My hiccups usually stop immediately. 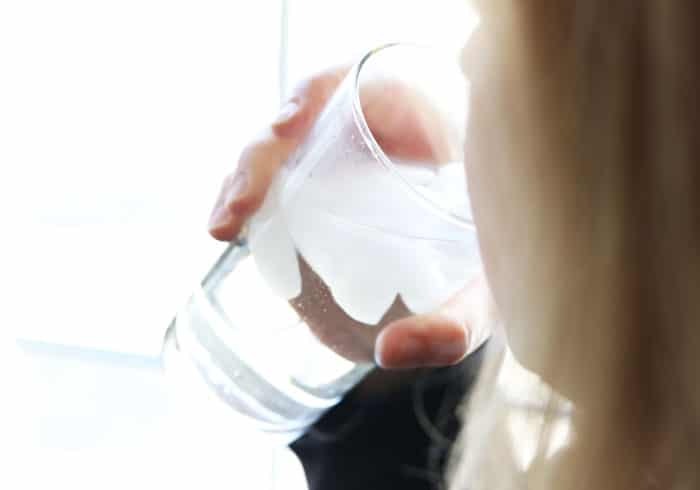 I always take 9 drinks of room temperature water, and it works every time!! I must appreciate this article where found the best remedy to my hiccups in the midnight. Counting till 10 works faster. It help me solving my problem. Thanks. Doesn’t breathing in involve contracting the diaphragm? So you technically are doing the opposite of stretching it. Thank you! Usually the ‘drinking water upside down’ trick works for me, but wasn’t this time. So glad I found this. Did 3 rounds to be sure and it’s worked a treat! This worked for me and I am SUPER great full. Thanks so much for sharing this with everyone! THAT MAKES SO MUCH SENSE. I’ve been holding my breath for 30-60 seconds to stop my hiccups for years, but never thought of it as stretching the diaphragm. The series of inhalations is a new one on me, though, and it helps a lot. Thank you! Been having hiccups for days just tried your breathing techniques and it worked. Thank you so much for this! I just woke up (it’s midnight) with a horrible case of the hickups. This worked on the first try. Thank you! Had the hiccups… googled…. found this.. tried it and it WORKED!! Thank you!!! Thank you! It hasn’t worked yet, but it think it has lessened the intensity of the hiccups, I’m sure it will work eventually! Thanks! That actually worked for me. I found your site yesterday while boarding a plane & couldn’t stop hiccuping. NOTHING worked, including several acupressure sites that usu. work for me! Thank you for your Website! I have to add something to it that might help it work better. I’ve been doing a lot of work with Chinese/Asian exercises, which stress deep breathing and lung work (to increase the flow of breath into the lungs). When I did your exercise (above), I turned my head to the side & inhaled as deeply as I could, but still hiccupped. Then I put my hands near my groin, fingers in, thumbs facing my hips, which opens the lungs a bit more. Then I could inhale more, and THAT stretched the spasm out & the hiccups stopped! Hopefully this extra step might help someone else, too? Thank you again for posting this! I really was desperate & you saved me!! Totally hasn’t worked and I’ve done it 7 times now. Awesome!! Glad it worked on your first try! This worked so great for me….:)!!!!!! It worked like a charm.I did it on my first go and my hiccups went away with no struggle. Really it works like magic. I have just got rid of from hiccups by doing two breathing sessions. I just did three rounds of this and it worked like a charm! Thanks for sharing! The one fix that has always worked for me – take a mouthful of water, plug your ears with your fingers, bend over at the waist and swallow. I think it has something to do with not swallowing air; I’m not sure. I just know even if I occasionally have to do it a second time that’s all it takes and it works. Thank you for the awesome tip! Never knew the science behind hiccups! Don’t know why, but a trick I learned from my teacher in second grade works every time. Hands make soft fists, then extend your index fingers and bring the tips as close to one another as you can, without touching. Really concentrate. Worked on 6-year-old me, still works on 65-year-old me. Thank you, Sister Mary Celeste! Stretches have never worked for me. Just eat a teaspoon of peanut butter. Cures hiccups every time. Genius! Worked instantly. Peanut Butter!!! I might try this next time I get hickups. I have tried so my different techniques but there is only one that ever really worked for me since I was a toddler. I close my ears with my fingers and then take little sips of a drink (preferably non carbonated water) and swallow Minäkinreally slowly and carefully. Using a straw works if you have Noone around to hold your glass. I do this till I feel my body relaxing. Sometimes, like you, I need to start over if a hickup gets through. It looks strange and my boyfriend always feels really embarrassed but it ALWAYS works. And I get hickups quite often and sometimes really bad. Try it! Might be an easier solution for your kids. This worked so well for me, thanks for sharing.My husband walked in on me and started laughing at me but who cares when it works!